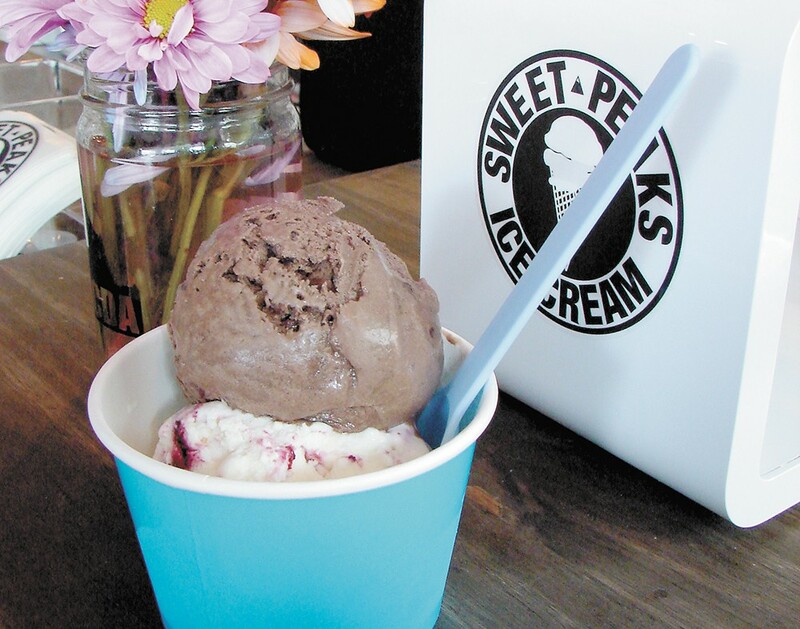 Sweet Peaks Ice Cream is located right in the mix of Coeur d'Alene's downtown dining scene. We've heard of red wine and chocolate cake, but beer and ice cream? Yes, says Marissa Dauenhauer, who along with husband Sam recently opened Sweet Peaks Ice Cream in Coeur d'Alene. "We like to find a local ingredient and tie it into a new flavor, or we think of a new flavor idea that is a spin-off of some other food or idea, and then attempt to source a part of the flavor locally when possible," says Dauenhauer. They paired with local Slate Creek, which is also known for serving peanuts, incorporating the local brewery's Double Black Diamond IPA and peanuts into a vanilla-based ice cream. Sweet Peaks' espresso features DOMA coffee, with or without Biscoff cookies. Try coconut dream, grasshopper mint, huckleberry or chocolate "love" in a cup or cone ($3 single, $4 double, $5.50 triple). Add $1 for scratch-made waffle cones or splurge on a sundae. Standard combinations include the Hokie Pokie with candied honey and sweet cream ice cream, or the Salt Lick with salty caramel ice cream, hot caramel sauce, whipped cream and cashews ($4.50). Sweet Peaks Coeur d'Alene is the fifth location for the Dauenhauers, who opened their first shop in Whitefish, Montana, in 2010, followed by shops in Bigfork, Kalispell and Missoula. They source milk and cream from a Montana-based Hutterite dairy and produce 16 flavors at any given time at their Whitefish facility. The Coeur d'Alene location features a roll-up garage door counter with outside seating, and scattered standing and seating areas inside the space formerly occupied by ArtCoLab, just steps from Sherman Avenue. Brightly colored, fresh-cut flowers in Mason jars and a silhouette of a girl feeding a moose make the space feel friendly and hip.